Ladbrokes is one of the largest betting companies in the world, with more than £1 billion in revenue in 2013, and it bills itself as “The world’s leading sports betting and gaming company.” As part of its full suite of online gambling products, Ladbrokes operates a poker room on the iPoker Network, which is among the top five in total player volume among all Internet poker providers. With a hefty 200% up to $2,000 first deposit bonus and ongoing regular promotions, there are plenty of reasons to make Ladbrokes your online poker home. If you do decide to move some or all of your play over to this site, you’ll benefit from the Ladbrokes VIP Club, wherein you can receive returns amounting to up to 41% of the rake you pay at the tables. Unfortunately, players from the United States are unable to participate at this fine poker room due to the legal climate created by the UIGEA (Unlawful Internet Gambling Enforcement Act) of 2006. While Ladbrokes is happy to take action from players in many other parts of the world, there are some notable exceptions, like France, Canada, Russia and Portugal. Be sure to check the list of restricted territories on Ladbrokes’ website to find out if you can open an account. Check out Ladbrokes Poker today and get started at the tables! As a new player at Ladbrokes Poker, you’ll be entitled to a Welcome Package, which includes a bonus of 200% up to $2,000 on your first deposit to your account. Your first deposit bonus isn’t tied to the use of any code at Ladbrokes; it is instead automatically applied after you make a qualifying deposit. 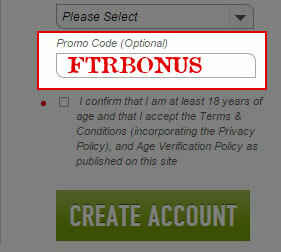 But you should still enter the promo code FTRBONUS when creating your account to make sure that you’re eligible for any special FTR benefits that may be offered from time to time. You can get a bonus of up to $2000/€1,500/£1,200 upon making your first deposit. This bonus will require a playthrough to be met before the funds are converted to real money and added to your account. As you play poker at Ladbrokes, you’ll be rewarded with Status Points. It is by earning these points that you’ll release increments of your first deposit bonus. For every dollar, euro or pound you pay in rake or tournament fees, you’ll get 10, 14 or 16 Status Points respectively. Every time you earn 170 such points, another $5 portion of your bonus will be awarded. You’ll have 90 days from the date of your deposit to unlock as much of this bonus as you can. The way the numbers work out, this bonus is equal to 29.4% rakeback. This number will vary a bit depending on your account currency and the currency of the tables you play at, but it should be close to this figure. The Ladbrokes welcome bonus is not the greatest offer on the market, but it’s far from the worst. Because it clears in bite-sized chunks, even micro-stakes players should be able to earn a few portions of it within the 90-day timeframe. Besides the value offered in the first deposit bonus, Ladbrokes Poker rewards new players in a variety of other ways. If you fund your account today, you’ll get four tokens allowing you to participate in €2,000 New Depositor Freerolls, and you’ll also gain entry into the weekly €1,250 Depositors Freeroll. There are also special Beginners Races that award €500 each week to the players who can accumulate the most Status Points at special Beginner Tables. These tables are exclusively for those players who have opened their accounts within the past 90 days. As long as you can rake $2 in a week, you stand a very good chance of earning a payout from the Beginners Races. While Ladbrokes rolls out the red carpet for new players, it doesn’t ignore its existing player-base either. With the Weekly Booster promotion, players are rewarded with up to €50 each week depending on the amount of Status Points they’ve earned in the previous week. With the Four of a Grind offer, you can participate in a points chase every day whether you play SNG, MTT, regular cash games, or Speed Poker cash games. The prizes reach as high as €225, and you can keep earning them day after day! As you gather more and more Status Points by generating rake and paying tournament fees, you’ll begin to climb the tiers of the VIP Club. The higher your VIP level, the more Ladbrokes Points you’ll receive for every Status Point you earn. You can use these Ladbroke Points to purchase instant cash, bonuses and tourney tokens in the rewards shop. The benefits of advancing within the VIP Club include access to exclusive freerolls, special rake races, and a better conversion rate for your points when spending them to get rewards. Players at the highest rank, Emperor, who maximize the value of their Ladbrokes Points can see cashback rates of around 55%. Find out more about the benefits of the VIP Club by reading our comprehensive Ladbrokes VIP Club Review. For a more in-depth look at the bonuses on offer, read our Ladbrokes Poker Promo Code review. Don’t wait around; access your $2,000 bonus today! In 1886, two gentlemen by the names of W. H. Schwind and Pennington formed a partnership to back horses trained by Schwind. This partnership didn’t have a formal name; no name was necessarily as they didn’t take bets or really have any dealings with the public at large. However, in 1902, a bookie named Arthur Bendir entered the enterprise. He convinced the other partners to shift their attention from backing horses to wagering on them. Bendir also spotted a signpost featuring the name “Ladbroke” while visiting Schwind and thus found a name for their business. At first, Ladbrokes catered to a high-class set of gamblers. Many of the firm’s first customers were drawn from the ranks of exclusive gentlemen’s clubs in London, such as the Athenaeum. Another segment of the population courted by the company was officers in the armed forces, who were induced to place bets by some of their comrades-in-arms who were quietly in the employ of Ladbrokes. Far odder than the odds she lays. Ladbrokes enjoyed great success in the first half of the 20th century, but business began to stagnate during the middle of the ’50s. With the death of Helen Vernet, the last of the partners, in 1956, the company was sold to Mark Stein and Cyril Stein, an uncle-and-nephew team, for £100,000. The new owners saw the importance of offering Ladbrokes’ services to a broader range of customers than just the well-to-do. They began advertising and introducing new types of wagers with lower minimums in order to make it easier for the ordinary racetrack fan to participate. When UK laws were changed to permit betting shops in 1961, a new era dawned for the entire UK gambling scene. Ladbrokes was one of the first big names in the industry to embrace this new method of offering gambling, opening its first shop in 1962. The Steins plowed much of their profits back into the acquisition of additional betting shops. By 1966, the company had an IPO on the London Stock Exchange in which it was valued at £1 million. Over the next few decades, Ladbrokes continued to expand. In addition to running over 1,000 betting shops, the firm bought casinos and hotels. In the year 2000, it opened up an online sportsbook and casino. Adding to its online portfolio, Ladbrokes partnered with Microgaming in 2004 to open up a poker room although its traffic remained separate. In 2009, Ladbrokes decided to join the network-wide player base, and segregation of its players ended. 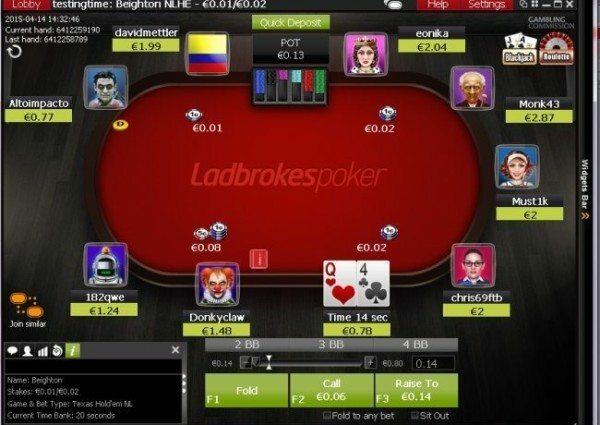 After nearly a decade using Microgaming software, Ladbrokes announced that it signed a deal with Playtech, the operators of the iPoker Network. 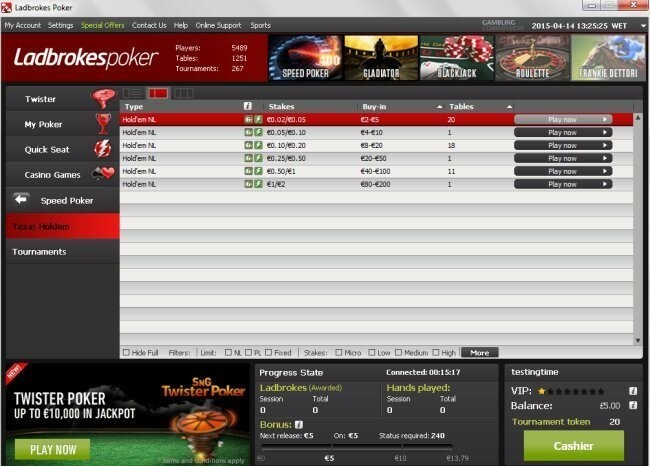 In December 2013, it switched from the Microgaming Network to iPoker. Ladbrokes now has land-based betting shops in several European countries, not just the United Kingdom. There are more than 2,700 of these shops. Online, the company offers sports-betting, single-player and live-dealer casino games, bingo, poker, lotteries, and more. 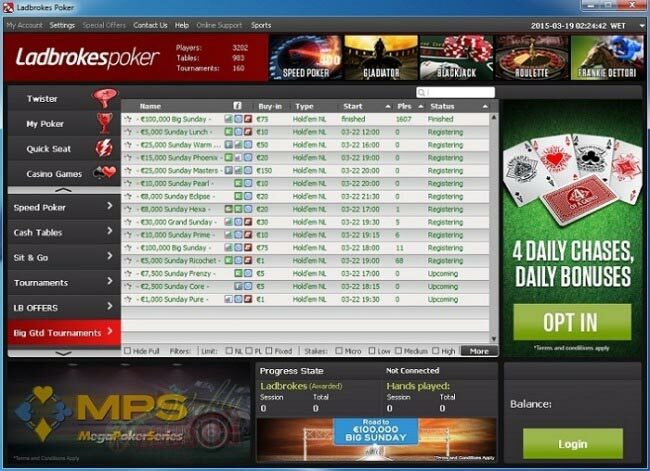 As part of the iPoker Network, players benefit from high traffic, slick software, and plenty of types of games available. There are many network-wide promos running at all times as well as special offers specifically for players at Ladbrokes.com. Playtech was founded in 1999 as a gambling software provider. 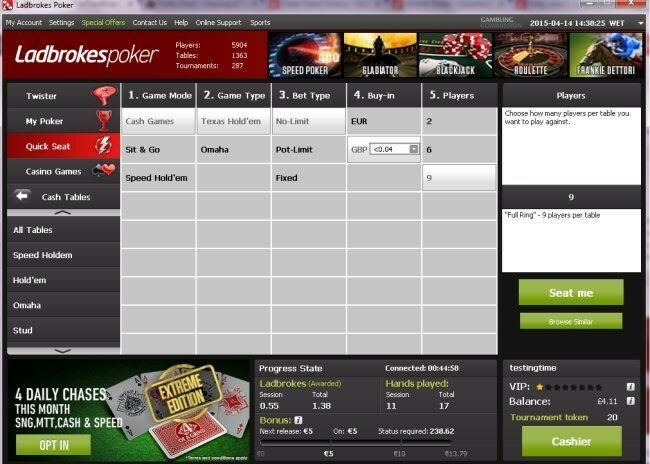 In 2004, they debuted the iPoker software, which has been continuously refined and updated ever since. This means that the current iPoker software is the result of more than a decade of upgrades, tweaks, and new features designed to give you, the player, the best possible experience at the tables. 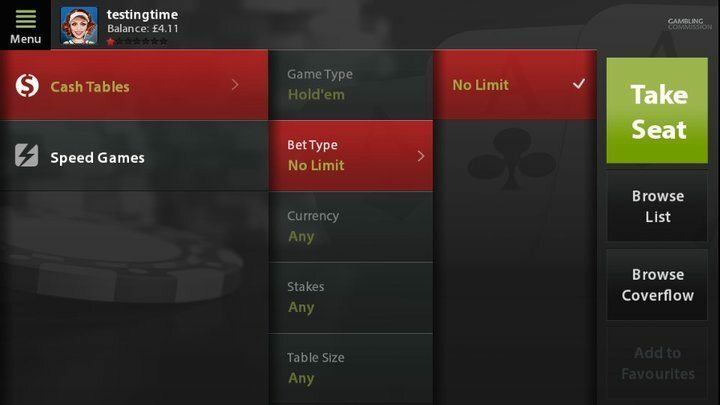 By navigating through the Ladbrokes Poker lobby, you can view only those games that you’re interested in playing. You can begin by clicking on the categories on the left. Other subcategories will appear, enabling you to drill down further to find the exact games you’re looking for. After you’ve selected the appropriate categories, a sortable list of games will be displayed in the center of the lobby. If you want to filter the games further, you’ll find some check boxes towards the bottom of the lobby as well as a “more” button that contains advanced filtering options. If you can’t be bothered to wade through all these options to identify a table that appeals to you, then the “Quick Seat” function is for you. It allows you to rapidly jump into an open seat at the game of your choice. 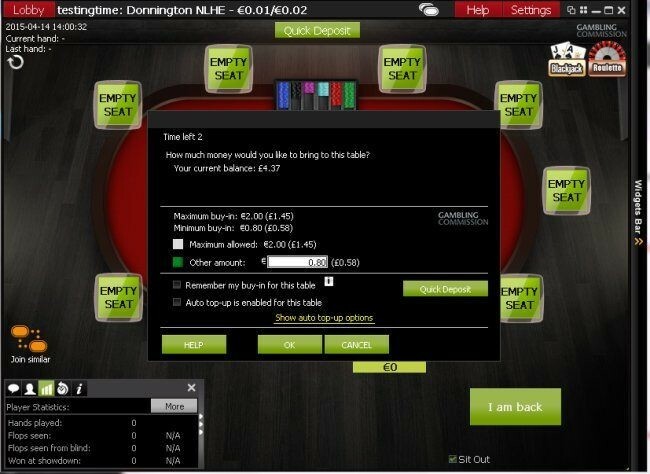 Ladbrokes’ table graphics themselves are clean and sharp; however, the tables can appear a little cluttered at times especially with the chat box and other functions taking up space. For those who will be multi-tabling, the Ladbrokes Poker software supports up to 16 tables of simultaneous play, both in cash games and in tournaments. Mini table views are also available but cards can become hard to read in these downscaled windows. To avoid overlapping windows, Ladbrokes does offer a custom resize tool or you can opt for the cascading tiles. But overall with tables resizing well, betsize buttons, and a sleek interface the Ladbrokes client definitely competes with other poker sites. Ever since Full Tilt Poker debuted RUSH Poker in 2010, fast-fold poker has become quite a popular format. 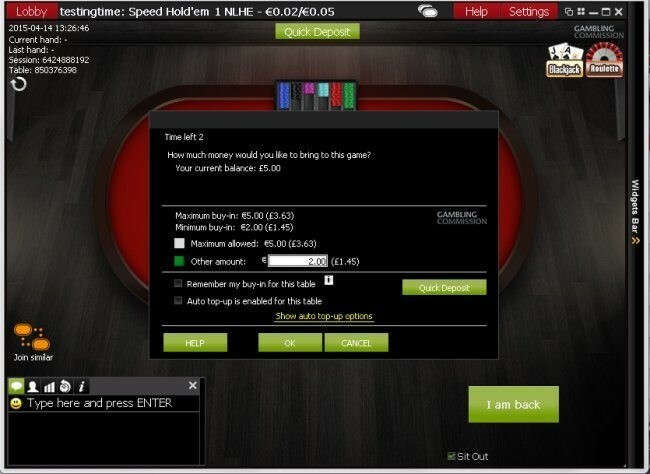 In 2012, iPoker introduced its take on fast-fold poker, “Speed Poker.” In Speed Poker, players who fold their hands don’t have to sit and wait for the next hand to be dealt; they are instead transported immediately to another table to play another hand. This means more hands per hour, faster bonus clearing, and increased points accumulation. 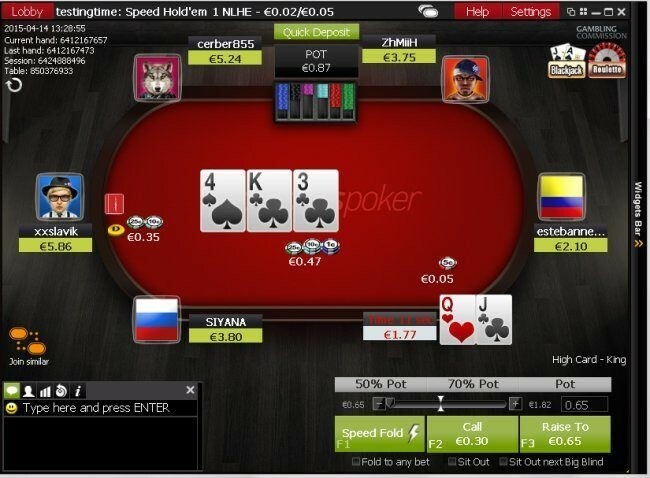 The instant hand history or IHH is accessed directly at the table. It is available on a per table, per session basis and is thus excellent for live information gathering. The record begins after the first complete hand a player observes or participates in. Hands can be scrolled through both backwards and forwards. 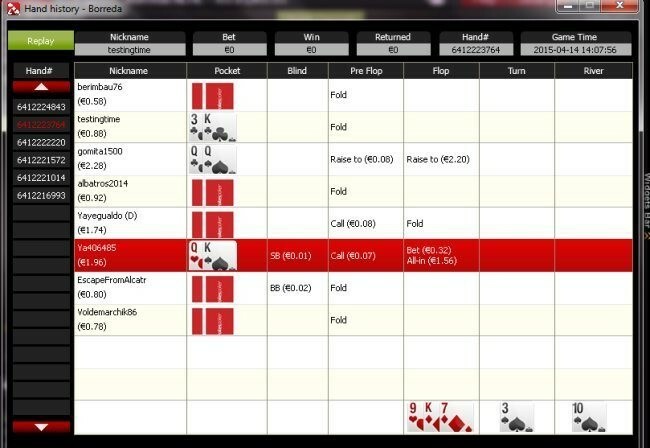 To view the list of hands played so far just click on the Instant Hand History icon which is found at the bottom-left of the table frame. This will open in a new window and can be used alongside the table but will not tile automatically. To access an instant replay rather than just a list of hands played click on the green ‘replay’ button found at the top left of the screen. If you’re interested in apprising yourself of some of the finer points of the Ladbrokes Poker software, be sure to peruse our Ladbrokes Poker Download Review. To get started playing on this feature-rich software today, visit Ladbrokes and open your account today! 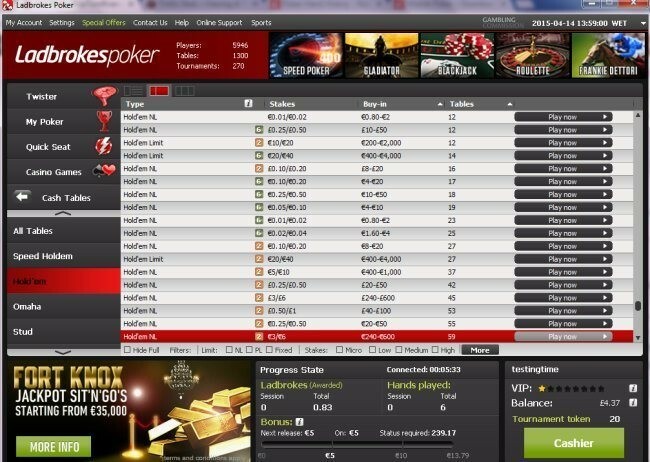 Ladbrokes Poker shares traffic with the other iPoker skins, which cater to a mainly European player base. The time of day with the highest player count is typically somewhere around 16:30 ET although this varies a bit by a couple of hours in either direction. These times correspond to the evening in Europe, when Ladbrokes players have finished with their daytime routines and are ready to get in some poker action. No Limit Hold’em cash games are found at stakes ranging from .01/.02 up through 5/10, denominated in both GBP and EUR. These are the only tables that use pounds; all other games allow you to gamble solely using euros. There’s plenty of action, even at the highest stakes, at all times of day. Pot Limit Hold’em is also spread at these sames stakes (in euros only), but the action tends to be much sparser. 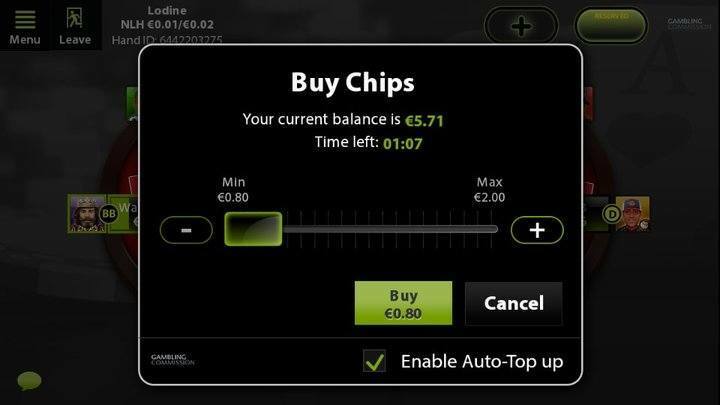 Limit Hold’em fans will find games running from €0.02/€0.04 all the way up to €20/€40, but most of the action is at €1/€2 and below. During non-peak hours, it may be difficult to find an LHE game you want to play. 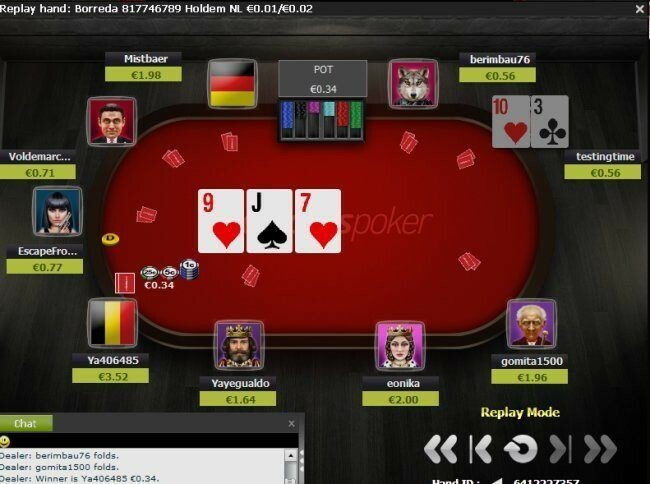 Pot Limit Omaha seems to be the second most-popular game at Ladbrokes, with plenty of action from €0.02/€0.04 to €5/€10. However, a lot of the action above €1/€2 during slow times of day consists of heads-up games or people sitting at a heads-up table waiting for another player to join. The other games that are spread are Pot Limit Omaha Hi-Lo, Limit Omaha Hi, Limit Omaha Hi-Lo, 7 Card Stud Hi, 7 Card Stud Hi-Lo, and Razz. There are seldom more than three tables running at each of these games at a time, and the traffic is heavily concentrated in microstakes. Ladbrokes features SNGs at buyins from €0.10 through €5000, but most of the games running seem to be at the €20 level or lower. Because of the many types of formats of Sit and Go offered, it might be difficult for players to multitable if they wish to dedicate themselves solely to one format. Besides a few freerolls, there are also MTTs that take Ladbrokes Points as buyins. Buyin tourneys start at €0.10, and the most expensive event on the regular weekly schedule is the €250-buyin €25,000 Grand Monday tournament. Like at many other sites, Sundays feature a more robust tournament schedule than the other days of the week. The €30,000 Sunday Masters is Ladbroke’s major weekly tournament with a buyin of €150. Tournament devotees should check out the recurring iPOPS series, which contains events of varying buyins to allow nearly everyone to find something that interests them. 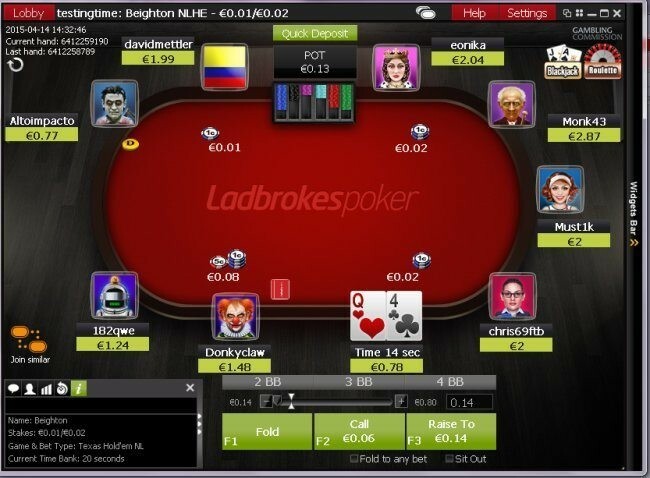 Some of the freerolls at Ladbrokes feature thousands-strong fields, but the turnout at other tournaments is quite a bit less. Low-buyin options tend to get between 100 and 500 entrants while the tourneys with buyins greater than €20 often attract fewer than 100 runners. On Sundays, however, the numbers tend to increase a bit. Tournaments that are part of an iPOPS schedule are more popular with punters, drawing sometimes more than 3,000 entrants. Play at your favorite form of poker today by signing up for a Ladbrokes Poker account. 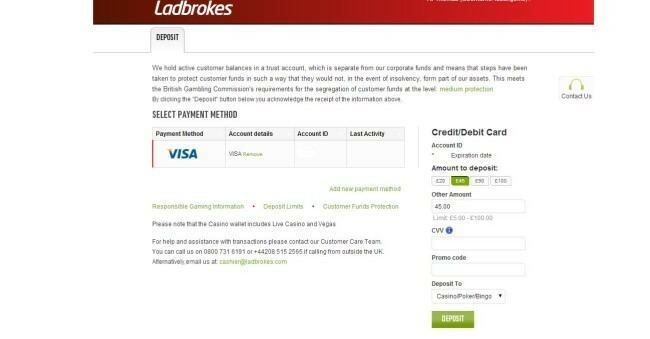 Ladbrokes wants to make it easy and convenient for you to move your money to and from the site, so there are about a dozen different methods you can use to make deposits and withdrawals. Take a glace at the right sidebar of this page for a list of the different methods available. Note: Some of the information regarding minimum or maximum transactions as well as a few of the cashier methods available will differ depending on your location. Always look within the Ladbrokes cashier for the most up-to-date information. Most of the deposit options at Ladbrokes allow you to fund your account with as little at £10, and credit cards and UKash enable you to do so with just £5 if you so choose. Customers who walk into a physical Ladbrokes betting shop can make deposits as small as £1, and can also request their winnings via the same means! All things considered, debit and credit cards are probably the most convenient way to deposit funds for most clients. You can put between £5 and £99,999 into your account in this way, and the transaction will be processed near-instantly. To make a first deposit you will need to enter your full name and a payment source (usually this will be your credit or debit card details). After this you will be taken to another page which lists your existing payment sources. All you need to do is choose the amount you wish to deposit, enter the security code (CVV code) from your credit/debit card, enter a promo code if you have one, and choose which wallet to deposit the money into (the options are casino/poker/bingo, or games, exchange, or sportsbook). To play poker you should select the casino/poker/bingo wallet but if you make a mistake you can easily transfer money between your wallets. Click deposit to proceed and you should receive confirmation of a successful deposit on the next screen. Whenever you need to check your balance, make deposits or withdrawals and transfer money between wallets, just click on the Cashier button while logged in to the Ladbrokes software. Your Deposit at Ladbrokes Is Successful! From the main site, click on the cashier link then choose withdrawal from the top bar. You can then choose which account to withdraw from and where you would like to send the money. 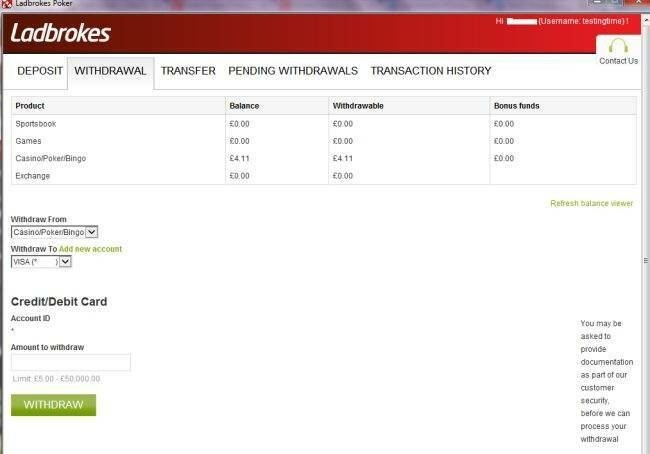 View your pending withdrawals and transaction history using the tab from the top bar. Ladbrokes takes seriously its responsibility to verify that its customers are who they claim to be and are above 18 years of age. Ladbrokes attempts to verify this info through a third-party electronically, but there are cases where the verification doesn’t complete successfully. In such a case, Ladbrokes may require that you provide documentation. For reasons of security, the Ladbrokes team doesn’t accept documents sent by email. Instead, you’ll have to fill out a secure form, which will allow you to upload your image files of your paperwork. Remember to send good-quality scans of documents that are fairly recent (within 12 months). This will expedite the process of returning your account to good standing. 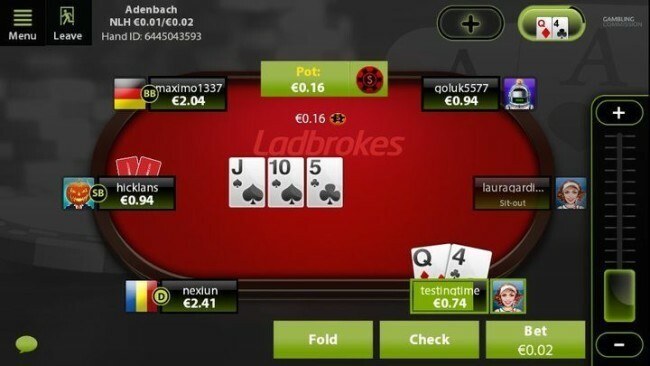 Mobile poker is becoming an increasingly important market segment for online gambling operators, and Ladbrokes is no exception. You can download an app for your iPhone, iPad, or Android device and begin playing at your convenience wherever you happen to be! Unfortunately, the iOS app is only available in the app stores for the UK and Ireland. The Ladbrokes Mobile App is a great alternative to the computer-based client and surprisingly functional for a small screen. After logging in you will see the main lobby screen. From here you can access cash tables, speed games or edit your settings and visit the cashier. Clicking on tables brings up further options and once you have chosen what type of table to play at, just click the green “Take Seat” button. Choose your buy in and then click buy to join the table. Once at the table you will find the tables easy to view and all alerts make play easy. With bet size functions and plenty of settings to choose from you’ll get up to speed in no time at all. As a full-service bookmaker and online gambling company, Ladbrokes offers several convenient means for players to get in touch with the support division. Personnel are available 24/7 to give you answers and address your concerns. By logging into your account on the Ladbrokes webpage, you’ll get access to the live chat support facility. If you’d rather communicate via email, you can do so by using a webform. Ladbrokes operates several support phone numbers for its various product offerings. For gaming support in the UK, dial 0800 032 1133. Customers outside the UK can call +350 200 43003. For more than a century, members of the British public have known that they can trust in Ladbrokes for fair action, prompt payouts, and competent service. Now that the 21st century is upon us, these benefits extend internationally and through a varied product line, which includes not only poker, but sports, casino games, bingo, and more. Take your seat at the Ladbrokes poker tables today! Get started by creating your Ladbrokes account now. 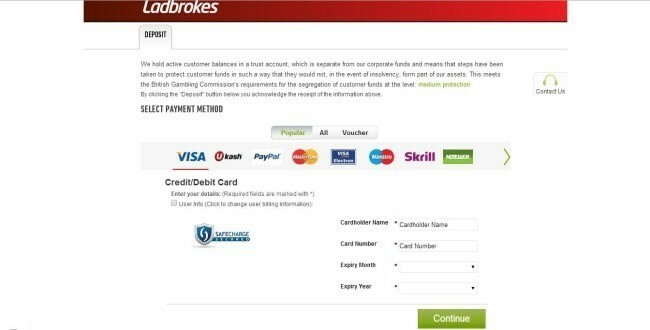 Find Ladbrokes Poker download instructions at LadbrokesPokerDownload.net. You can get the latest Ladbrokes promotion codes at RedeemBonusCode.co.uk.